It's a full local diary for the next two months ! Please note we have put up a temporarystage in the fuction room of The Biddulph Arms.....as Eliza and Saul tend to sit down to play.....also....come and see the new lighting system...everything to make for a great night. September for another night of jigs 'n' reels and ceili chaos. Admission is £2 and the dancing starts at 9.00pm. Many other fund raising gimmicks - Three Bears Raffle, Shop window Nursery Rhyme Trail, Irish Bingo, Duck race �. A Return To Gigging � And Plenty Of It! Followers of my music will know that I took some time off from doing my own stuff for a while. I wanted a breather from myself. After all, imagine being round me 24 hours a day without escape. You�d want a break from me too. On the 16th, I�ll be playing a benefit for the Palestine Aid Convoy that leaves Liverpool that weekend. It�s at Mello Mello on Slater Street and kicks off at 8pm. Please support it and raise some funds for the people of Palestine. On Sunday 19th September I�ll be playing at the official TUC demo outside Lib Dem Conference at the Echo Arena. 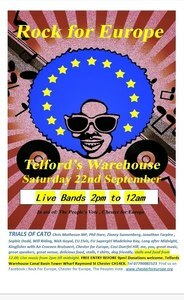 Come along, give the beige Tories some grief, and hear some speeches and music. More importantly, show the government what we think of their cuts. The demo is at noon. Moving into October, I�ll be playing the Musicport Festival in Bridlington. This is the biggest indoor music festival in the whole wide world. I�ll be there on Friday October 22nd and will be on the North Sea stage somewhere around 9ish��..
Man�s Ruin (the band I share with Vinny and Gabi) will be playing too, so there�s plenty of chance to hear my dulcet tones in one form or another. See you soon. It�s good to be back! Lymm rugby club, Lymm, WA13 0AT...hope you can come along? If you want to reserve a ticket ring or text me so you won't be disappointed. ALL THURSDAYS AT THE SPREAD EAGLE UNLESS DIFFERENT VENUE LISTED (DIRECTIONS LISTED BELOW) & STARTS AT 20.30 PROMPT! http://www.vingarbutt.com/ � for the uninitiated, Vin offers quite the most emotionally-rounded night it's possible to encounter in the live music arena. One minute your sides will be splitting at his unabashedly comedic persona, the next you'll be jettisoning your own eyeballs in a Geneva Fountain of tears as he performs one of his characteristically heartfelt songs.� Don�t miss him�and we usually sell-out so get your tickets quick! Support: John Condy & Mick Hare,@ the Spread Eagle. http://www.martinsimpson.com/ �There is no doubt that after 35 years as a professional musician Martin is, right now, better than ever�one of the finest acoustic and slide guitar players in the world, his interpretations of traditional songs are masterpieces of storytelling. His solo shows are intense, eclectic, spellbinding and deeply moving. Successfully combines the diverse elements of British, Afro-American and old-timey music. His 15 years living in the US were well spent. In addition his own songwriting has produced some real gems, from the truck-stop epic, �Love Never Dies� to the profoundly moving �Never Any Good� and "One Day". LYMM RUGBY CLUB, Crouchley Lane, Lymm , WA13 0AT (on A56, heading towards Altrincham, take first right after the Church Greenpub). AmandaLynne Music presents a musical food and drink taster of original acoustic song-writing around the streets at Nantwich Food and Drink Festival on 24-26th September. Just listen out for the sound of live unplugged music and you're sure to find fine food, drink, and FREE entertainment there. For Folk's Sake, Manchester based promoters of monthly folk nights have announced their Autumn and Winter schedule. There's a new venue now, upstairs at the Kro Bar, 325 Oxford Road, Chorlton on Medlock, Manchester M13 9PG, (the one near the University) which was packed out recently as Twelfth Day launched their debut album. Thursday 2nd December - A Very Ceilidh Christmas! Monster Ceilidh Band + Jack McNeill & Charlie Heys + Marry Another. A little change � for one Month only! Tickets - during the evening THERE WILL BE a collection to cover Donal�s travelling expenses and to cover the cost of a bed for the night at a local hotel! RSVP - I would appreciate it very much if you could let me know in advance if you will be coming. Session musicians and friends welcome as always! Please forward this to anyone you know who�d like to come! Words & Music Festival is nearly upon us once more (Oct 7 � 10) so I just wanted to let you know our headliners this year include the wonderful Martin Simpson, Mark Radcliffe and the Big Figures, Fyfe Dangerfield and the lovely Thea Gilmore. If you could point anyone interested in the direction of our website www.wordsandmusicfestival.com they can find out all they�ll need to know there. Just as a personal point of interest Thea Gilmore�s new Album Murphy�s Heart just got to number 41 in the midweek album chart (I�m on it and everything), and that her show at the festival will be a unique affair quite different and more intimate than the full band line up tour that we will all be taking a short break from to run the festival. Hanley Park sees the 2nd annual Samba Mela on Oct 17th 2010. Confirmed for the mainstage we have Bonafide, Raghavm Khiza, Aly Hash, Gorilla Chilla, Young Twist and Republic of Swing! the chance to interact with all the acts from the main stage ...in t...he interactive workshops which were a hallmark of last years event. Keep the date in your diary, and check out www.sambamela.co.uk for all latest updates and artist confirmations! See you all on 17th October in Hanley Park! The defining voice of contemporary English Folk Music, Kate Rusby�s exquisite interpretations of Traditional songs and finely wrought self-penned tunes have won her an audience that reaches beyond the genre. A rare achievement for a folk artist but entirely understandable given Rusby�s expressive vocals that invest whatever she sings with irresistible emotional depth. On stage Rusby delivers every time. Her bands never cease to amaze, always comprising the cream of Britain�s folk instrumentalists, while her between-song stories and introductions are cut through with a hugely engaging Yorkshire wit. She is truly an artist to be cherished by lovers of good music everywhere. Kate is visiting Wrexham with an all new line-up and the set will include material from her forthcoming album.